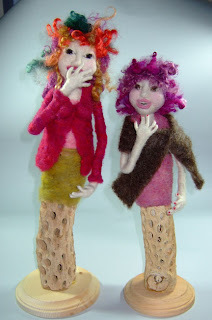 Louie Girl Accents & Accessories specialize in wet and dry felted creations. 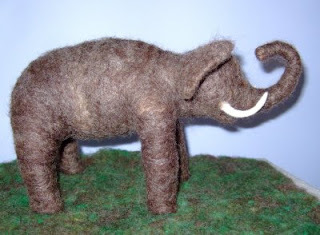 3D sculpted miniatures, custom wall hangings and pillows. 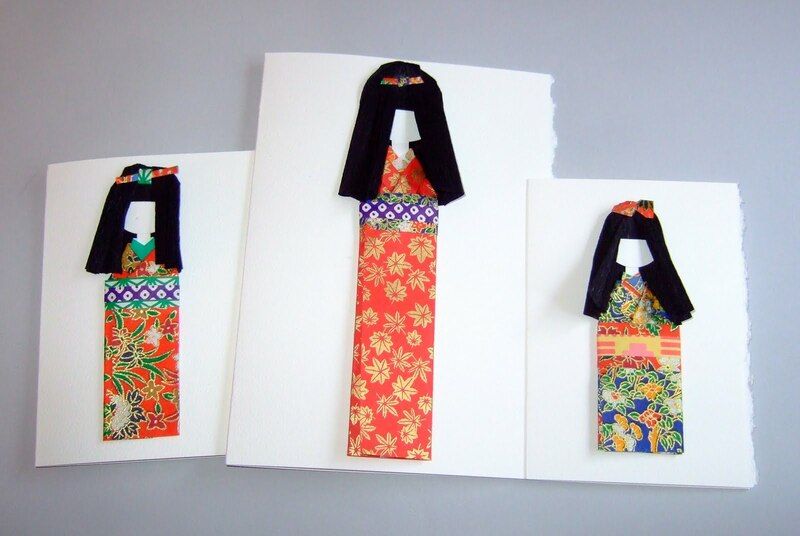 I love colorful origami paper and found a fabulous way to use some of my collection. 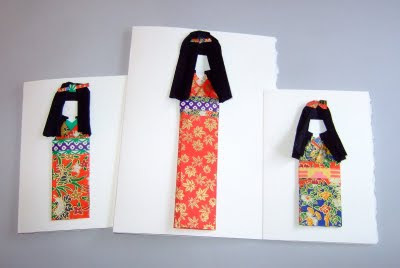 These Japanese paper dolls make great note cards to both collect and gift to others. 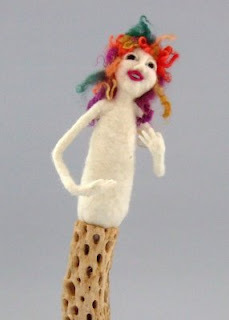 Ningyo "human figure" dolls seal friendships, protect or purify those who use them, and help children explore their roles in society. Their history also reflects the development of religious and political ideas. These alien-like healthy germs will protect you from the H1N1 flu or at least will help make you smile. 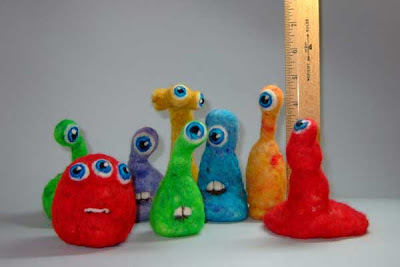 I was inspired by a felter in Finland to create sculptures of what healthy and happy germs might look like to help ward off the H1N1 germs. 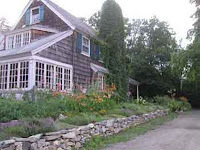 A visit to the Cape might be just what's needed to get some artistic rejuvenation! The sun, the sea, the surf, oh my! 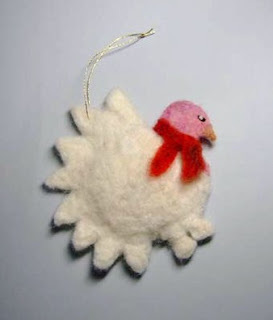 Stay tuned for some great creations when I return, or at least another blog entry. October 4 & 18, 12 - 3 pm. 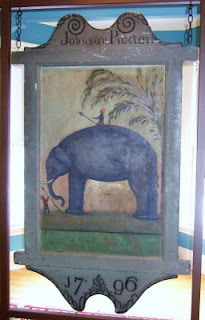 An elephant's trunk pointed up symbolizes good luck - hopefully there will be oodles of people visiting the show. 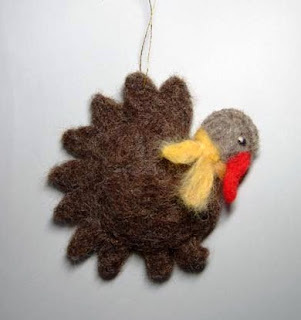 An explanation of needle-felting and a sampling of the fibers used will also be displayed for those not familiar with the process. 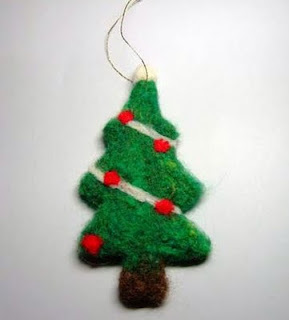 Dyed and natural wool fibers are blended to create the desired color palette. This was both fun and challenging and I'm glad that I"m part of the show. Due to the overwhelming number of artists, the show has been scheduled as two distinct presentations. The first presentation continues now through Aug 2nd, an then the second presentation (where my sculpture will be on display) will start Aug 15 - Oct 18 - the Salem News had a great write-up of the current exhibit. Trunk is UP - better luck will follow! 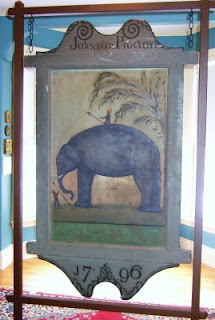 I'm participating in a "Historic Interpretation" of an artifact at the Peabody Historical Society, Peabody, MA. Area artists were asked to choose an artifact from the Historical Society and create their interpretation using their medium of choice. 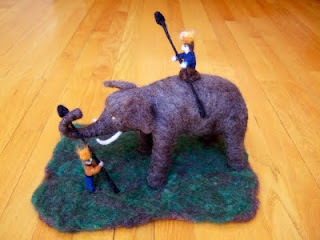 I decided to create a 3-dimensional “sculpture” of the elephant and rider made of wool sheep fibers over a wire armature based on the Johnson Proctor Tavern Sign. 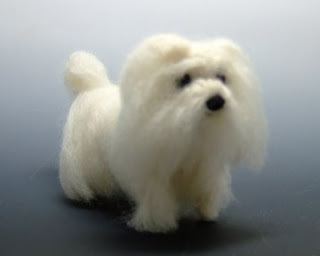 I'm currently working on a commissioned "mini-me" doll named Belinda. I've never met the real Belinda and am working from photos. Along with the photos, I received a fabulous written description so that I could try and create a close likeness. I'll be posting photos of my work in progress. 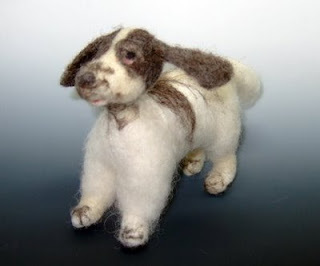 I started with basic white fleece, created the head and have added the features... Belinda "has a bit of a crooked smile" which I accentuated to help capture her personality. She now has a partial body.. I finally had some time to spend in the studio. 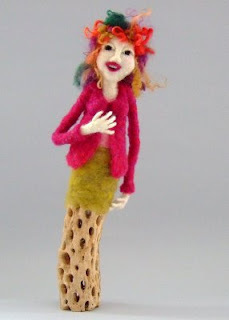 My first doll creation from the Art Doll Workshop was really lonely and needed a friend so I created someone to keep her company. They are so happy that they have each other to "gossip" 'er talk together. 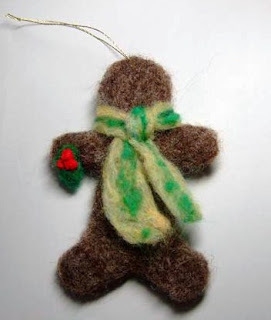 I posted status of the doll workshop backwards so that you could see my final product first! ... what should I do with my hands? 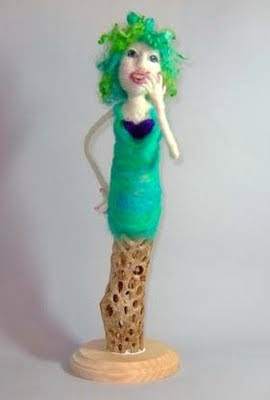 I'm finally back in my studio starting a Doll Workshop, offered by Marie Spaulding. I'll be posting pix as I progress along. 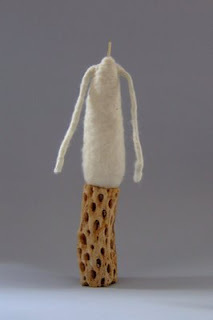 This photo shows the base (cholla) with needlefelt wool torso and wool wrapped wire armature arms. It's great fun learning new techniques. I found a fun "collage" tool within Picasa3 - here's the result of compiling ~50 photos. Building stone walls is extremely time consuming. 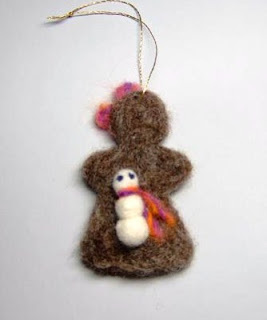 Each individual stone is felted, then they are layered one by one onto the felted background. The herbs, plantings and tree details are next. This rendering of J's Restaurant at the Nashoba Valley Winery is before the new outdoor patio was constructed. 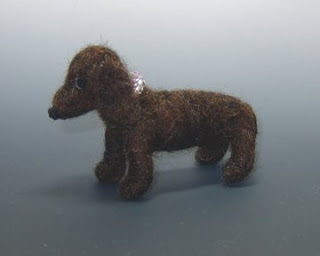 I'm trying something new on my felted animals, polymer noses and beaded eyes. I like testing new techniques to see if they enhance or distract from my overall intent. The puppies and some of the other animals periodically want makeovers, so this may be what they've been looking for - stay tuned! I started this scarf in early February and try to add a few rows every evening. This has been a fun and challenging project. 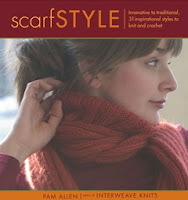 Pattern is from "scarfSTYLE" by Pam Allen. 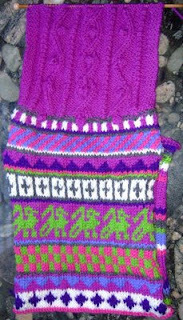 Knit with 100% worsted weight Nature Spun yarn. 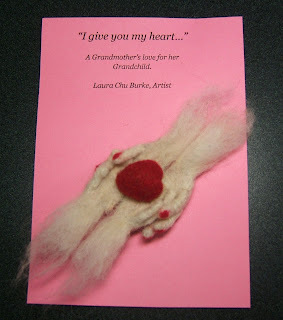 "...A Gransmother's Love for her Grandchild"
The overall size of the mini heart and hands ~2" x6". The heart is ~1" long. 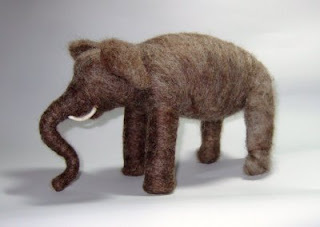 Here are a couple of my most recent felt creations. 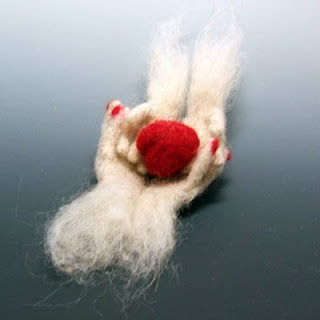 Needle felt on wool fabric pillow - size ~9"x12"
recreate with wool fibers was a satisfying challenge. 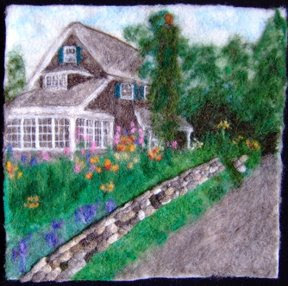 Wet & Needlefelt -based on Monet's ~15" x ~17"
As a fiber artist I create 3D figures, wall displays and custom pieces made primarily of wool fiber. My jewelry creations are periodically offered through Louie Girl and I continue to create and maintain websites for fellow artists, small business owners and non-profit charitable causes. Where in the World is Felt Alive? Laura Burke, founder of Louie Girl Accents & Accessories was created in 2002. 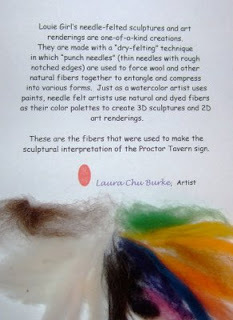 After a 23+ year in the computer hardware industry, Laura had the opportunity to start a new venture and focus on the softer side of fiberarts.